Bath City chairman Manda Rigby has resigned from the board at the Conference South club. Rigby said there had been a "breakdown of trust" between herself and board, over financial plans which she believes will put the club's ground at risk. Bath have been hit by financial problems in recent years and Rigby has invested a significant amount of money to help keep the club afloat. "I wish the club every success, on and off the pitch," she said. We would like to place on record our thanks to Manda for all the hard work she put in during her time as chairman of Bath City, and we wish her all the best in the future. "Currently the board are recommending a course of action at the AGM which I believe puts the ground at risk because of the knock-on consequences of preferring one creditor over the others. "I cannot support a proposal I think is not proven to be in the best long term interests of the club and has been advised against legally. I understand the personal reasons why other directors feel differently, but cannot agree with them." A Bath and North East Somerset councillor, she became club chairman in August 2011 and, at the time, was the only female to have the role in the top five leagues of English football. However, she has been unable to reverse a trend that has seen Bath post a financial deficit for each of the last 50 years. 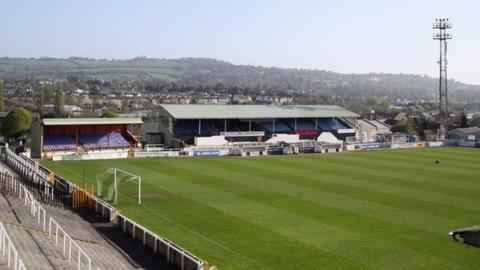 Money problems escalated following their relegation from the Conference Premier at the end of the 2011-12 season, and speaking in January, Rigby warned that the Romans could fold unless they sold their stadium in Twerton, where they have been based since 1932. Having now decided to step down, she confirmed the money she has invested in the club will stay in place for the time being, until a repayment date is agreed. Her statement concluded: "I have met, and been supported by, some wonderful, talented and generous people, and between us over the past two and a half years, we have kept Bath City afloat, and started the process of change with a plan to pay back historical debt, and ensure the club is sustainable."